It’s important to make sure your pets are well-hydrated year round to keep them happy and healthy. In fact, our research shows that one of the best ways to improve your pet’s health is to get them to drink more water. 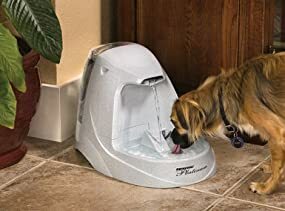 The Drinkwell Platinum’s all new design utilizes the same patented free-falling stream of water as the Original Drinkwell which encourages pets to drink more. By using a 5-inch falling stream of water, the pet fountain continually aerates your pet’s water with healthful oxygen. A charcoal filter also removes bad tastes and odors, giving your pet the best, most appealing way to stay hydrated. The Drinkwell Platinum is self-contained meaning it doesn’t need to connect to a water line, and can therefore be placed anywhere in your home. It’s made of high-impact plastic that holds over one gallon of water, as well as a ½ gallon reservoir. It also features a new snap-on lid to prevent accidental removal and a pre-filter to catch large particles before they reach the motor. The new submersible pump on the Platinum creates a nearly silent operation, and the adjustable control valve allows you to regulate water circulation for a water flow that works best for your pet.